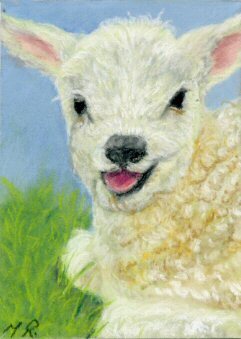 My thoughts on painting a lamb became a reality and this is the sixth painting in a week, I’m really enjoying working with pastels again but wonder if the public like pastel ACEO’s, time will tell whether I stick to pastels for a while or revert back to acrylics. This is in my opinion a lovely cheerful painting for Easter. This entry was posted on Sunday, March 23rd, 2008 at 11:22 pm	and is filed under Traditional Art.